We are well aware that the correct and systematic quantification and reporting of GHG emissions enables the Group to reduce their associated impact, contributing to a reduction in global pollution. To limit the amount of harmful emissions released into the atmosphere, a monitoring system involving periodic checks has been introduced at all sites. In light of the results of the monitoring process, measures are implemented to guarantee the efficiency of the systems and the efficacy of the ongoing actions in the Group. In recent years we have significantly reduced our GHG emissions: in 2010-2012 they fell by 12.8% and we are committed to reducing them further in 2013-2015. 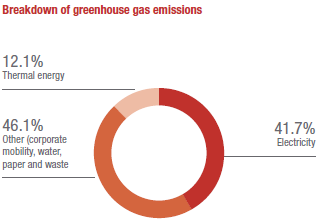 In 2013 total GHG emissions amounted to 98,448 tonnes of carbon dioxide equivalent (CO2e) deriving from electricity, thermal energy, corporate mobility, water, paper and waste. Our emissions per employee came to around 2.9 tonnes of CO2e. 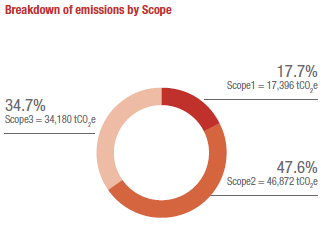 Scope3: emissions other than indirect GHG emissions from energy consumption that derive from greenhouse gas sources owned by the company or by other organisations, such as emissions connected with business trips, assets used (water, paper, etc. ), the mobility of employees, etc..
Scope1 and Scope2 GHG emissions amounted to 64,268 tonnes of CO2e, a 3.3% reduction compared to 2012. They are in-depth reported in our document Inventory of GHG Emissions of the Generali Group, that is certified in accordance with ISO14064 standard by an indipendent body.